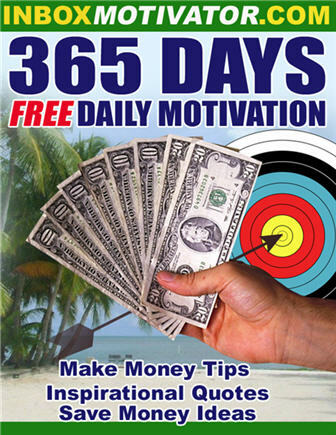 "365 Days of Free Tips, Insights, Ideas, Inspiration and Motivation"
You Will Have a 20 Year Online Guru Teaching You Every Day Direct To Your Inbox! Do You Dream About Wealth And Financial Success? How many times have you spent the morning, afternoon, or evening just dreaming about what it would be like to make more money and be a wealthy person? Have you ever really thought anything like that could actually happen to you? Well, it can! No more daydreaming, no more wishing on a star, just the simple, clear information you need to start making your dreams reality. *Note: This is not a typo, it's not a fairy tale, and it's not some kind of sick, pathetic joke. No, this is a real. You can learn from my trial and error over the past 20 years but now you don't have to make the same mistakes and achieve your goals quicker and faster than every before. Tip #10: So many to pick from! Tip #11: It’s more the Why than the How! Tip #18: Work + Kids = CHAOS? Tip #46: Would You Leave Your Baby at home alone? Tip #49: If I scratch your back, will you scratch mine? Tip #57: THE HEALTHY DO NOT NEED A DOCTOR – IT IS THE SICK WHO DO! Tip #13: Learn how to do basic home repairs. Tip #14: Limit spending on expensive toys. Tip #15: Go to the movies less. Tip #16: Substitute expensive food for cheaper foods. Tip #17: Buy store-brand products. Tip #18: Use the slower shipping option. Tip #19: Buy gifts far in advance. Tip #20: Make your own gifts. Tip #21: Take public transportation. Tip #23: Purchase a speed pass for tolls. Tip #24: Purchase a pass for public transportation. Tip #25: Spend money on entertainment with high re-use value. Tip #26: Purchase video games with high re-play value. Tip #27: Limit consumption of flavored drinks. Tip #28: Make coffee or tea at home. Tip #30: Reduce alcohol consumption. Tip #31: Replace incandescent light bulbs with compact fluorescents. Tip #32: Use the air conditioner and/or heater less frequently. Tip #33: Hold a yard sale or setup a booth at a flea market. Tip #34: Invest more time into comparison-shopping for expensive products. Tip #35: Base grocery shopping and meal plans around the availability of coupons. Tip #36: Don’t become addicted to spending. Tip #37: Meet with a financial planner. Tip #38: Shop for clothes at second hand stores. Tip #39: Shop at bulk stores. Tip #40: Cook in bulk. Tip #41: Go on fewer vacations. Tip #42: Limit spending on vacations. Tip #43: Go on cheaper vacations. Tip #44: Re-finance your house. Tip #45: Replace steak with chicken and pork. Tip #46: Eat less meat. Tip #47: Ask your credit card company to lower your interest rates. Tip #48: Pay off high interest rate debt. Tip #49: Ask to get fees waived. Tip #50: Ask your cable television provider to offer you a cheaper package. Tip #51: Move into a cheaper apartment or home. Tip #52: Re-finance your car. Tip #53: Sell your car. Tip #54: Purchase a cheaper car. Tip #55: Purchase additional razor blades, rather than entirely new razors. Tip #56: Re-fill ink cartridges, rather than buying new ones. Tip #57: Re-finance your student loans. Tip #58: Create a carpool for getting to work. Tip #59: Improve your gas mileage. Tip #60: Add air to your car’s tires. Signup now to get our 365 day e-course that is chock full of tips, tricks, ideas and inspiration. Without this information you face serious obstacles to achieving the kind success and wealth you deserve! P.S. You will be so glad you can finally stop trying to get your business on the path to success the hard way. Don't spend weeks or years trying to "figure it out" let us show you the way!